It has been nearly 90 years since Alexander Fleming took the first step toward discovering penicillin in 1928. Since mass production began in 1941, people have been using antibiotics to treat minor and major infections alike. One of the earliest uses of antibiotics was in the treatment of infected wounds suffered by Allied troops in World War II, and this undoubtedly saved lives. Today antibiotics are used to treat everything from minor scrapes to urinary tract infections to bacterial meningitis. People under the age of 75 don’t remember the world without them; a world where any infection, small or large, could lead to serious illness or death. Antibiotics are a valuable shared resource for all human beings, one that we certainly take for granted. In the last two decades, the world has seen a dramatic increase in antibiotic resistance (when bacteria stop responding to drugs designed to kill them), reducing the number of antibiotics that can effectively treat bacterial infections. 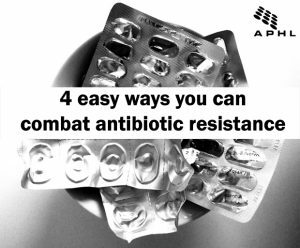 Over prescription and misuse of antibiotics is a key contributing factor in the spread of resistance. If we do not take swift and significant action to address our rampant antibiotic use, we run the risk of returning to a world where people die from what we now perceive as minor illnesses or infections. 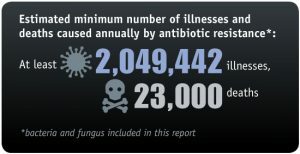 According to CDC, right now antibiotic resistant infections are responsible for at least 2 million illnesses and 23,000 deaths in the US every year, and this number is only expected to grow. Increased resistance to commonly used antibiotics leads to fewer treatment options for the most vulnerable individuals including premature infants, cancer patients and the elderly. Some resistant bacteria also have the potential to spread to others, making antibiotic resistance one of the most significant and challenging public health threats we currently face. This is a public health problem that cannot be combated by doctors and scientists alone. Reversing this trend will take a concerted effort from the entire population to become better antibiotic stewards. What can you do to help combat antibiotic resistance? 1. Ask the Right Questions. When your healthcare provider suggests treatment that includes antibiotics, don’t be afraid to ask if it is truly the best way to treat your infection. It could be just as effective to treat your symptoms and let the illness run its course. Don’t make this decision alone, though. Talk with your healthcare provider. 2. Know what types of illnesses are most likely to respond to antibiotic treatment. Antibiotics will do nothing to fight off viruses like the common cold and flu. 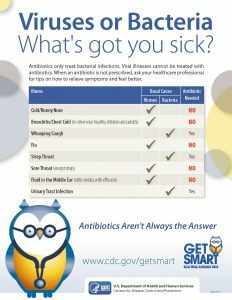 This table provides a good quick reference to when antibiotics might be needed. 3. Ask for the test. Ask your healthcare provider to order tests that will identify the source of your illness. If necessary, you can also request an antibiotic susceptibility test to ensure that the antibiotic being prescribed is the correct one. (Not all antibiotics work to fight all infections.) This eliminates unnecessary use of incorrect antibiotics which can lead to unnecessary treatment and increased risk of resistant infections in the future. 4. If you do need antibiotics, follow the instructions and take the full course. Failure to follow the instructions of the prescription (how much to take and how often to take it) can lead to the development of antibiotic-resistance among the harmful bacteria you are trying to treat. Harmful bacteria that are exposed to antibiotics may begin to develop properties that allow them to survive – or become resistant to – exposure to antibiotics. Although it may be tempting to stop taking an antibiotic when you start to feel better, the full treatment is necessary to completely eliminate the cause of your illness. Stopping treatment early can result in the illness reoccurring later and help the proliferation and spread of antibiotic resistant bacteria.